Researchers at Iowa State University have been searching for answers about how tornadoes interact with buildings and how to prevent weather phenomena from turning into widespread disaster scenes. To test their theories, the university has a tornado simulator that creates a funnel cloud over a model town. Around 90 percent all tornadoes are categorized with an intensity level of EF3 or less, but even those have top wind speeds of 165 mph. EF5 tornadoes can produce winds over 200 mph. Partha Sarkar, who designed Iowa’s tornado simulator over 10 years ago, studies the loads and pressures caused by simulated storms passing over models of homes and buildings with his students. And he’s concluded that there are things about tornadoes that many engineers still don’t understand. 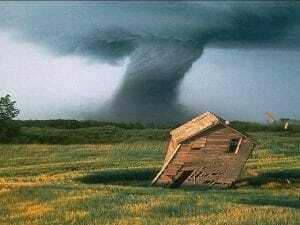 -How do nearby buildings and lands affect tornado winds? -How does the age of a building impact tornado damage? -Which structure shapes are best suited to withstand tornadoes? -What roof types are best for tornado-prone areas? -What types of trusses, walls, and nails are best for strong tornado winds? -How do internal pressures inside buildings affect tornado damage? -How can building codes reinforce safety in tornado zones? Sarkar’s team and a Texas Tech University team received two three-year $250,000 collaborative research grants to help answer these questions and make their findings known to engineers who work in tornado-prone areas. But it’s important to remember that tornadoes know no geographic boundaries and can happen anywhere at any time. In the U.S., there’s a second tornado season that hits in the fall, around early November when the weather patterns begin to shift. Tornadoes have been well-documented in the United States, but are also likely to occur in Canada’s prairie provinces, northeastern Mexico, northern Argentina, southern Brazil, Britain, Bangladesh, and southern Russia. And unlike hurricane season, which can often be forecasted in advance, tornadoes are dependent upon atmospheric patterns that are unpredictable and can form quickly without much warning.